On 9 April at 2:55 p.m. Caledonia, eastbound New York-Glasgow, relayed to Bulgaria an ice warning received earlier from Cassandra. Dimensions: length 500 ft. width 58.2 ft. depth 33.4 ft.
1914 Aug. Requisitioned by British government and became a troop carrier for 212 horses and 3, 074 troops. 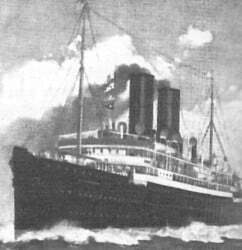 1916 5 Dec. Torpedoed and sunk by German U-65 in Mediterranean Sea, 125 miles east of Malta.